Dan Somers drives a cab in West Palm Beach, Florida. 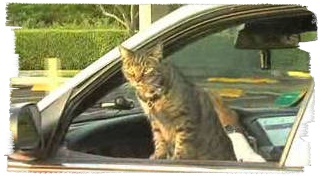 His cab is the best-known cab in town since he began bringing his cat Rambo along while he works. Rambo loves to ride and look out the window, and people love riding with the cat. Rambo gets along well with most fares, but will hide under the seat when a drunk man is riding.